Concrete Yards, Roads and Floors - C.C. 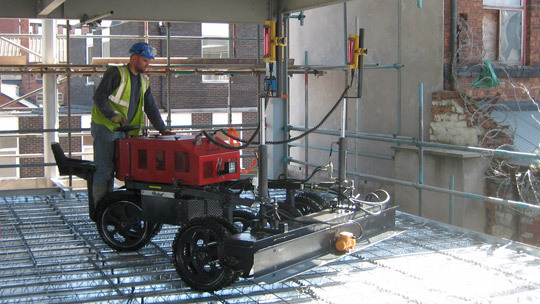 Contracting Ltd.
Our laser guided screed enables us to construct the large jointless slabs made possible by the evolution of concrete reinforcements. Whether you require a new power floated concrete floor to FM2 standard, or repairs to a concrete yard, C C Contracting are able to meet your needs. Years of experience and a skilled, permanent labour force gives us the ability to satisfy your construction requirements efficiently. You may be a developer looking for a single concrete floor or several concrete floors for a new industrial estate. You may be a factory owner requiring a new concrete yard extension or floor reconstruction. We undertake the following types of work: power floated concrete floor construction and repair, heavy duty concrete freight yards, durable materials handling yards or light storage yards, offering construction, extension and repair. Concrete or asphalt road construction and repairs. Perhaps your forklift repair bills are becoming too high due to the poor state of your concrete floors or yards? Perhaps your uneven floors or concrete yards cause loads to be spilled creating loss and wastage of products and materials? Are your warehouse floor joints are deteriorating and causing narrow aisle trucks to become unsafe? Are you running out of usable space for storage or production? Are poor surfaces a Health & Safety issue with trip hazards? Expansion or maintenance, whatever your needs, contact C C Contracting Ltd. We understand the needs of industry and can devise solutions that cause minimum disruption to your business.